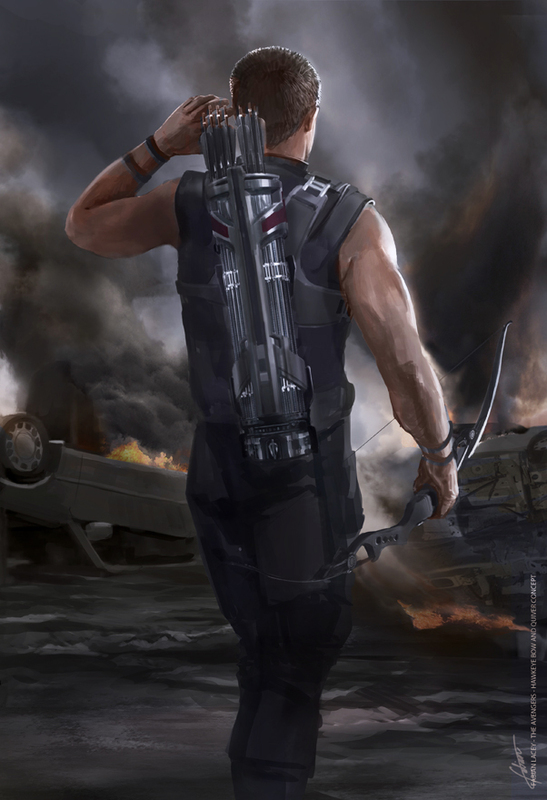 Hawkeye is longtime member of the Avengers who uses a bow and arrow to create a varied array of effects. He has appeared in multiple media including comics, books, video games, cartoons and movies. In the MCU films Hawkeye is played by actor Jeremy Renner. Hawkeye has appeared in the films Thor (Briefly just a silhouette), Avengers, Avengers Age of Ultron, and Captain America: The Winter Soldier. Hawkeye has been mentioned as a potential character to appear in a speculated Black Widow film. "I always thought it would make sense early on to do a Hawkeye/Widow movie because they’re quite similar. They don’t have powers, have high skill sets and have history together. But I don’t think there are any discussions about that happening. I’d love to do it though." Clint Barton is an orphan growing up in Waverly Iowa. Clint and his brother run away from the orphanage and join the Carson Carnival of Traveling Wonders. At the carnival Clint is recruited by the Swordsman to be his assistant. The Swordsman and fellow carnie Trick Shot train Clint to be a master archer. When Clint walks into an office he finds that the Swordsman is embezzling money from the carnival and attempts to stop him. The Swordsman easily beats up Clint and pummels him on the ground. Swordsman walks away leaving Clint a bloody heap on the ground. Clint recovers and continues to work in the carnival as a master archer. His skills greatly improve and he becomes known as the attraction "Hawkeye the World's Greatest Marksman". After watching Iron Man swoop into action, Clint decides that he too has what it takes to be a hero. He dons his Hawkeye costume and tries to fight crime but due to a misunderstanding is accused of theft and is thought to be a criminal by the authorities. He then lives for a time as a fugitive where he runs into Natasha Romanoff aka the Black Widow a spy of the Soviet Union. Clint falls head over heels for the beautiful Russian and into her spell. Despite his advanced skills he is pretty naive and is easily coerced by Natasha Romanoff to help her steal technology from Tony Stark. During the theft Iron Man appears and he battle the pair of thieves. Hawkeye and Black Widow nearly manage to kill Iron Man but Natasha is injured and Hawkeye carries her to safety. Before Clint can bring her to the hospital she urges him to go straight and disappears. Thus ends the brief criminal history of Hawkeye. Hawkeye has a serendipitous meeting with Tony Stark's butler Edwin Jarvis. He saves Edwin's mother from a mugger and in a way of saying thanks Jarvis invites Hawkeye to the Avengers Mansion. Edwin also helps Clint clear his name and gain the trust of the Avengers. Seeing his most trusted friend support his old foe gives Tony Stark a change of heart. Tony as Iron Man sponsor's Hawkeye to join the Avengers. Hawkeye joins what is considered to be the 2nd Avengers team along with Quick Silver and the Scarlet Witch. Hawkeye is some what of a troublesome member of the team. He is extremely flirtatious with the Scarlet Witch which leads to confrontations with her brother Quicksilver. His anti-authoritarian views also lead Captain America to enter his cross hairs. Overtime though these problems are smoothed out and he develops close relationships with all of the team's members. Hawkeye remains one of the most enduring members of the Avengers. He also served beneath the mantle of the martial arts guise of Ronin. In this guise he used samurai weapons as opposed to his normal bow and arrow. Hawkeye takes on a job as the Head of Security for Cross Technological Enterprises where he meets SHIELD agent Bobbi Morse aka Mockingbird. The two discover that Crossfire has a plot to destroy the superhero community by using a sonic weapon that causes super-heroes to become aggressive. The two defeat crossfire together. Shortly, after this meeting the two become married. The two are asked by Vision to create a new Avengers team on the West Coast. The two then become founders of the West Coast Avengers. Hawkeye and Mockingbird fall out of love primarily due to the death of the Phantom Rider. The Phantom Rider kidnaps and initiates mind control over Mockingbird. During her mind controlled state he engages in sexual relations with her. When Mockingbird frees herself from the control and realizes that she has been raped, she fights him off. At the end of the battle, the Phantom Rider is hanging from a cliff and she refuses to help him, and he dies. While Clint is sympathetic for the abuse she has taken he can not agree with the killing of someone even someone as bad as Phantom Rider. The two split and Mockingbird leaves the team. Is at peak human conditioning and has a great deal of skills in acrobatics, marksmanship, fencing. Hawkeye's bow is hard for a normal human to draw, many have tried and failed. Arrows: Hawkeye's most notable power is that he uses a variety of arrows that can cause varying effects. Hawkeye's trick arrows have been shown to emit effects including; sonic weapons, rope weapons, explosives, gases, poisons, flashes, and more. He has a versatile range of weapons to fit the need of the situation and the ability to land the arrow in the exact spot that will cause the most damage. Serving as Ronin Hawkeye was revealed to have a very high level skill set with swords and other samurai weapons. Hawkeye is played by actor Jeremy Renner. Hawkeye appears as an Asset used by SHIELD in the movie Thor. In the movie he nearly kills Thor as he goes through a SHIELD compound attempting to retrieve his hammer. Hawkeye joins the first iteration of the Avengers team but not before being mentally controlled by Loki to do his bidding. When freed from the mind control Hawkeye helps thwart the invasion of Chitauri in New York City. Hawkeye will be a member of the Avengers in the film Avengers: Age of Ultron. He is one of the few members of the team to avoid being mind controlled by the Scarlet Witch. He forms a repertoire with twins when they have a change of heart. The team takes refuge in Clint's home where he reveals he has family. The film plays with the notion of Hawkeye being a relatively ordinary man in the company of gods. In the final climax of the scene is saved by Quicksilver who shields Hawkeye from bullets sacrificing himself. At the end of the film Hawkeye reveals that he is retiring from being an Avenger. Clint hears of the registration act and agrees with Captain America. He joins forces with his team and battles in the Air Port fight. He is captured and placed in the Raft in the prison. At the end of the film it is revealed that he was freed by Captain America.